To live everyday is to love everyday, despite the circumstances. 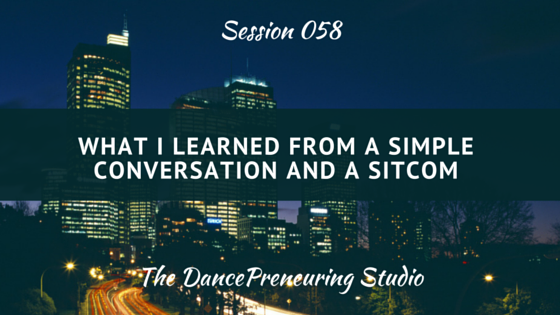 In this session of The DancePreneuring Studio, I am reminded of 7 lessons from a simple conversation and a sitcom. Step to Success: So who likes to drive in traffic? I don’t, but if it happens, then I want to know how long I will be in it, and if there are alternate routes to lessen the time. Today’s step to success is an app that I recently started using called Waze. I usually use Google Maps and I thought that was fine until I started using the Waze app. This free app alerts you to police, cars on the shoulder of the road, how long you will be in traffic. So yes, there are waze around traffic. Dancer’s Dialect: Soutenu is used in both ballet and jazz and means to support and draw one leg evenly to the other done in place with a half or whole turn, outwards or inwards. Check out this video of a soutenu turn. It was a simple reminder me that having a foundation and strong support whether in dance, business or other relationships, is so important in your personal and professional growth. I thought okay, if necessary, I will buy cipro 750 mg defend myself. I was standing behind her on a shuttle at a sitcom taping and I accidentally stepped on the back of her shoe. I apologized and forgot about it but she didn’t. It takes a team working together to run something effectively. From the cameramen, to the makeup artists for each of the actors, and all of these other people standing around, they all needed to work together. If you’re not patient, learn patience. You learn a lot about people by observing, even if you’re not in direct conversation with them. Be interested in others though. Everyone has different reasons for doing things and that’s okay. Some people are there for the money, the hopes of being discovered, some are retired and want something to do, some are people who are visiting from out of town and wanted to experience that part of show business, and me, I wanted it as a case study. Changing one letter from i to o gives more meaning to both of these statements. Live every moment. Love every moment. Love people. Question: What does it mean to you to live everyday?